Maybe you want to work with elementary students, helping them discover the joys of fitness and accomplishment. Or, help an elite marathon runner increase athletic performance. Or, perhaps you want to own and operate a fitness center, guiding your community of members to a healthier life. St. Ambrose has a program to help you be successful in any, or all, of your goals. Our graduates work at Quad Cities Acceleration, Feldman Performance, Unity Point Health, Pleasant Valley High School, and many more. 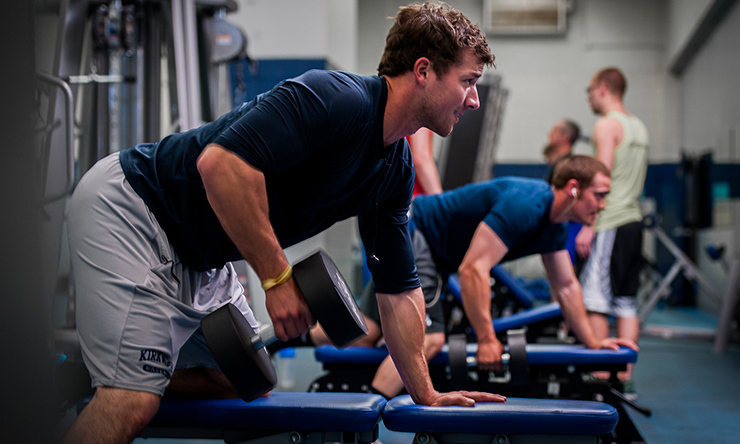 The human performance and fitness major at St. Ambrose provides you with a solid understanding and knowledge of the benefits of physical fitness, and you get to apply your skills now, not later. Be a personal trainer or step into a fitness leadership role while you're still a student. That's how we prepare you to be a professional. 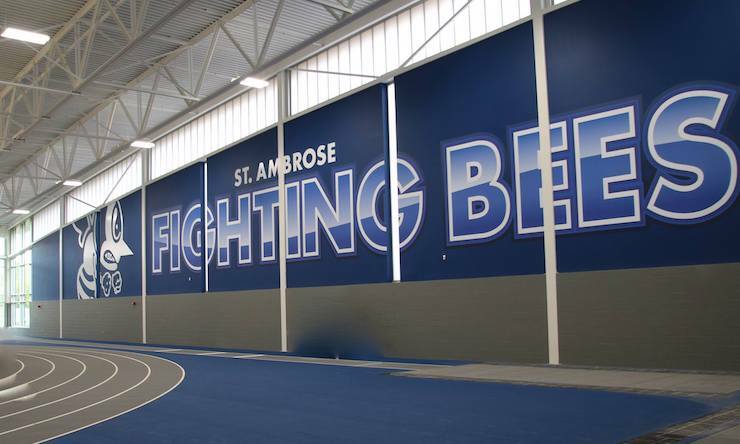 SAU students share how the new Wellness and Recreation Center already has enhanced their St. Ambrose experience. and law in sport, PE, exercise science, and leisure. 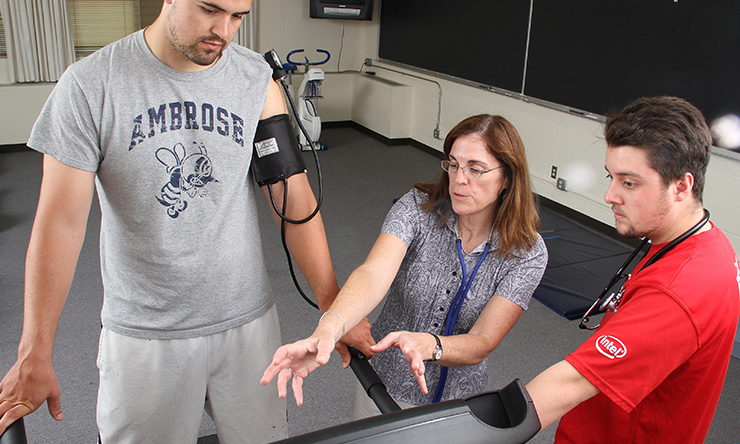 Our Kinesiology professors represent diverse fields of expertise and research and focus on giving you a well-rounded education. Students must be willing to engage in their learning and take advantage of many service and participation opportunities. Seniors participate in a semester-long internship as an important component of your education and development. The position, location, and duties you take on during this experience will allow you to connect your classroom learning with real-world situations. Don't worry: your professors will follow your progress during the internship, and as always, will be a resource you can call on if needed. You will also complete a project during the internship, and at the end of the semester, you will present it to a panel of industry professionals and educators. Common career tracks for human performance and fitness majors include personal trainer, strength and conditioning coach, employee fitness director, group exercise instructor, recreation program director, and health and fitness club manager. There is a growing focus on fitness and recreation by individuals, and more employers and insurance companies are encouraging physical activity and prevention. This gives you so many additional career opportunities. Career information from ACSM and NSCA. As a Human Performance and Fitness major, you get the amazing opportunity to take classes, and apply what you learn, in our new state-of-the-art Wellness and Recreation Center. This massive, 80,000 square-foot building just opened in September 2017 and holds exercise physiology and biomechanics laboratories, classrooms, research-quality equipment, and a group exercise room. The building was specifically designed and equipped to give you a top-quality education and personal fitness opportunities. The Quad Cities is a noted a leader in healthcare, wellness and fitness, making it a great community to prepare for, or even start, your career. The SAU College of Health and Human Services has deep, established relationships with major hospitals and healthcare providers, all who need highly trained health specialists. 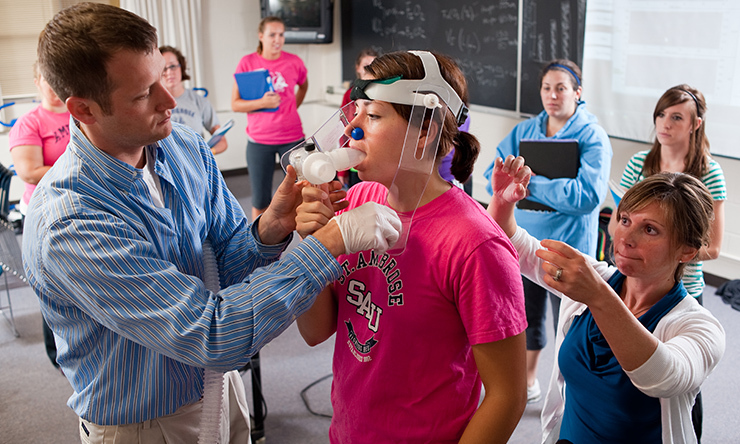 St. Ambrose students have a wide range of internship and clinical placement options without leaving the area. Organizations from the YMCA to the Rock Island Fitness & Activity Center offer a variety of opportunities for experts in wellness and fitness. Dusty Feldman '08 owns Feldman Performance Gym in West Liberty, Iowa; is a strength and conditioning coach at West Liberty High School; and a personal trainer director for the North Dodge Athletic Club in Iowa City. Kaitlyn Kielsmeier '13 continued her education and earned a Master of Kinesiology from Bowling Green State University, where she also worked as a research assistant and a teaching assistant in sport conditioning. Today she is a Health and Wellness Coordinator at Oregon Park District in Oregon, Ill.
Zachary Hild '16 is a Trainer at Quad Cities Acceleration. Grade of C or better required for BIOL 205 and all KIN courses 200-level or above required for this major. This is the suggested plan of study to graduate in four years with a major in Human Performance and Fitness. This plan assumes the student has not taken three years of foreign language in high school. Current students should use MySAU Portal Student Planning and consult with an advisor to determine graduation requirements.